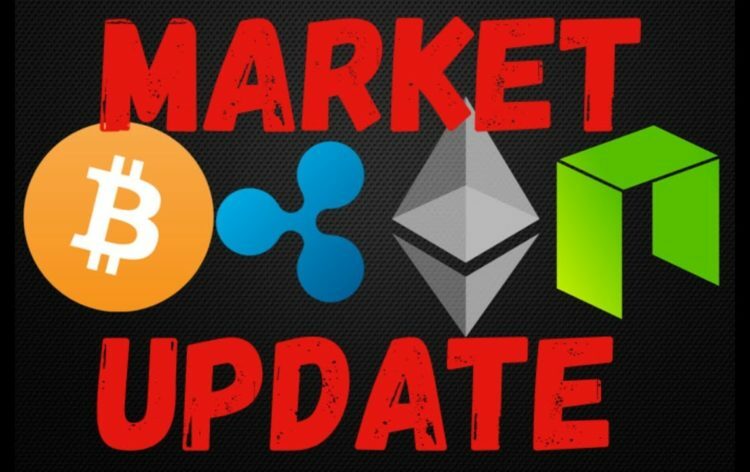 The week has begun on a positive note in the crypto markets as we see some signs of relief. Almost all cryptocurrencies were on a downtrend throughout the past week, and indeed over the whole year. However, if the trend continues for the rest of the week as it has done today already, then the markets may be in for another spike as it did toward the end of 2017. In this week’s crypto analysis, we are going to focus on 3 cryptocurrencies that we believe have clear trading signals. These are Ripple, Ethereum and NEO. Ripple has already shed over 80% of its value this year since its all-time high of $3.81 on the 4th of January. At the start of last week (week 12), the coin’s value was about $0.80, but it dropped below $0.60, losing over 25% of its value. We assume that many investors lost money last week because they expected prices to begin climbing. This is usually what many traders do after an asset has been on the decline. Nevertheless, remember what Jesse Livermore said, ‘It’s never too late to sell…’, and this is exactly what happened here. If we look at the chart below, we see where those investors went wrong with Ripple’s crypto analysis. As you can see, the price of Ripple was trending within a triangle chart pattern. Furthermore, it looked like it was trending downwards approaching the trendline around $0.80 marked in red. The problem was that there was seemingly no demand for the coin, hence the higher probability for a breakout to the downside. As it turned out, such an analysis would have been right, since this level was broken through and prices marched down toward the $0.65 support level marked in black. Fortunately, this support seems to be holding so far as we can see the hammer candlestick begin to form in today’s chart. To predict what might happen this week, we have to wait until the day ends. If today’s candle closes above the $0.65 mark, then the weekly outlook will be bullish. Otherwise, prices may keep dropping toward the next support at $0.30, although this is unlikely since most coins have been rising all through today. Ether too has experienced a sharp decline this year, and once again many thought it would recover. Instead, ether’s value dropped below $500 for the first time in almost 3 months! From the chart below, this move could have been predicted had the technical analysis been considered. 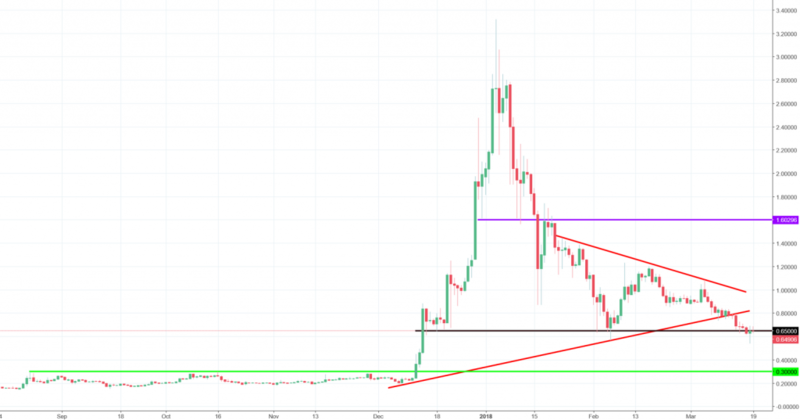 At the beginning of last week, Ethereum charts had formed a head and shoulders pattern. As you know, this is a major trend reversal chart pattern, and it proved right. 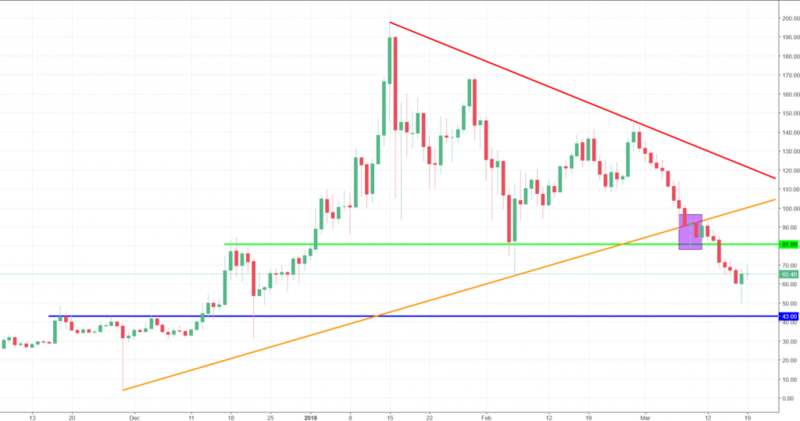 The neckline of the pattern was around the $700 level marked by the blue trendline, but when that was broken, prices fell to $500 and even lower on some exchanges. 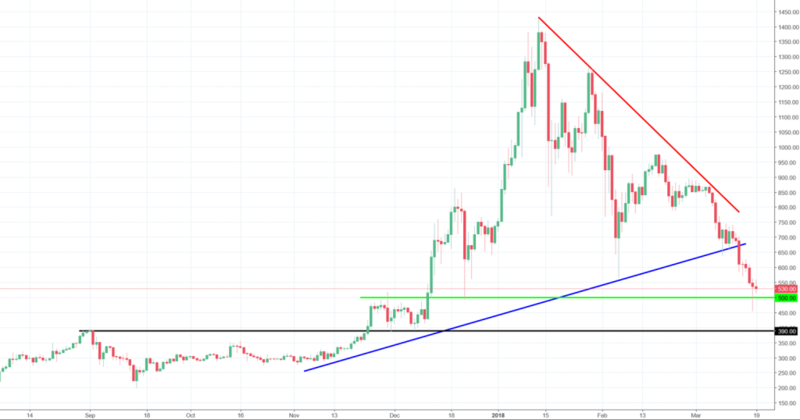 Despite last week’s drop, the prices have now reached the $500 support marked by the green line. Besides, the candlestick pattern here is a hammer, which is another signal of trend reversal. So far, the signs are positive and lean toward bullish momentum, which will be confirmed if prices stay above the $500 level. On the other hand, if the current day’s candle breaks below the $500 support, that would mean the Ethereum crypto analysis would turn bearish and head toward the $300 level. Finally, we have NEO that also declined last week, but there is no positive signs… yet. Last week, prices broke below the upward trendline marked in orange. Then, soon thereafter, prices broke below even the support at $81. These two signs showed that there was strong bearish momentum, and the NEO crypto analysis remains negative. This $81 level has now turned into a strong resistance level that is unlikely to be broken, which makes NEO’s crypto analysis negative. We expect that the value of this coin shall drop to the $43 level as long as sentiment remains negative. Chances of an uptrend are unlikely, unless there is a break above $81 soon.